As I work with some great theme parks, I am a member of the Themed Entertainment Association. 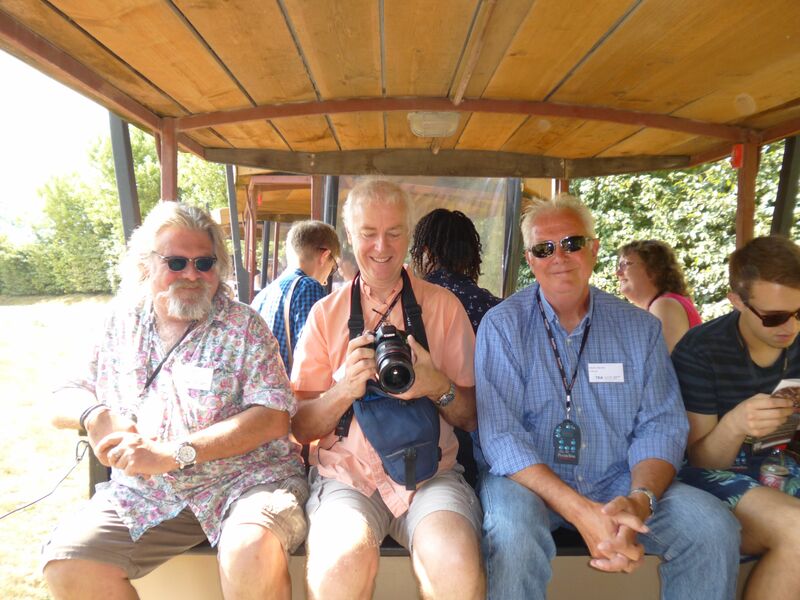 One of the benefits of membership is their organisation of visits to some of the best the world has to offer, to see what they do and how they do it. And I have just come back from Puy du Fou, and can safely say that it is, without doubt, the best theme park in the world. It’s a total one of a kind and without any of the conventional rides you associate with other theme parks. It draws in the local community, trains all its own staff through its academy, creates everything internally (even the shoes and costumes) and delivers spectacular, emotive and beautiful shows that you have to see to believe. It’s been created by Phillippe de Villiers, the father of Nicolas de Villiers who runs it today (and who showed us around). The control Nicolas still exercises is phenomenal. It’s not like any other brand. If anything it’s a little like Google in the way they controlled their growth in the early years but this has lasted for 35 years already. He even interviews the shortlisted kids for the academy and watches every Cinescenie to be able to feed back to the managers where they could do the show even better. The level of detail they manage is unbelievable and even the back stage areas are immaculate. We had a totally jam packed 48 hours and got to see behind the scenes of nearly every show. Here’s a summary of the best of them. The first show I saw there and an amazing introduction to life at Puy du Fou. It’s filled with eagles, horned beasts, vikings and marauders, all backed up with huge explosions, gigantic flames and boats magically appearing from stage left and under the water, with the performers disappearing with it. Animals everywhere and a large cast. It’s an amazing start and an even bigger ending. It’s a story of Excalibur with Merlin, mermaids, sword fights in the water, horses walking out of the huge hidden caverns underwater and probably the simplest of the whole lot we saw. It’s great fun, has the best safety warning I have ever seen (hilarious) and I saw it twice. This is a huge show that just keeps on growing. Spectacular horse riding, massive sword fights and jousting and flames everywhere. Then a disappearing castle, another HUGE castle that moves and rotates and amazing sounds and effects everywhere. There are things going on all over the place and we were lucky enough to get to see behind the scenes here. It was sooooo good, that a few times during the show I felt myself becoming a bit emotional. This is a huge great roman spectacular played out in a purpose built amphitheatre that seats over 7,000 people. Again, it starts off quite small and then just grows and grows. The cast is huge and varied and whilst the story is their own version of history, it’s still truly amazing. Just look at the pictures. I saw this one twice too. It’s the only inside show and simply massive. Perhaps a little hard to follow in french, but I found it far more enjoyable to just watch the show and ignore the story. It’s breathtaking but you aren’t allowed to take photos, so this is a sneaky one of the set, just as the flamenco dancers start going crazy. 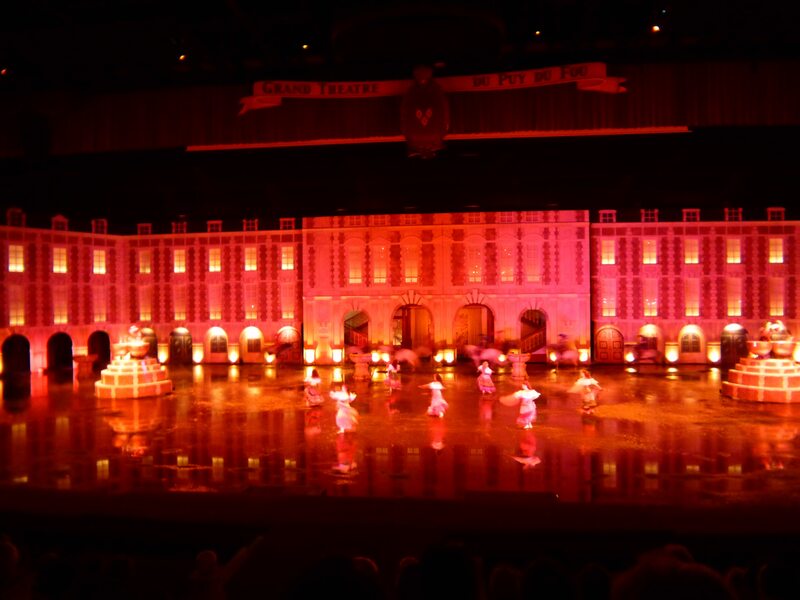 It’s quite reminiscent of Riverdance with horses and water and swords and explosions and…..
Puy du Fou has a huge indoor show called Richelieu’s Musketeer with a massive stage and even bigger cast. Now this was a real highlight. Again I saw it twice from two different seating positions. The first time from down in the pit gave a great view, but the second time, right at the back at the sides gave you far closer access to the birds. The show itself is incredible with beautiful, haunting music and a cast of over 170 birds. If you are going to sit at the very back, it’s probably best to shuffle forwards just a little so you don’t get pooped on by a vulture, like I did. There is simply noting like this anywhere in the world. It is totally breathtaking. This was the first night show I saw and can only be described as breathtaking (I’ve used that a lot haven’t i!). It starts with a lone violinist emerging, her dress lighting up and her floating around the lake playing music until she meets the pianist, who does the same. The orchestras appear, huge fountains emerge and an even bigger organ suddenly appears to add to the music and the gigantic party. I thought it was the biggest show I’d ever seen, but I hadn’t seen Cinescenie at this point! Now this show breaks record after record. It’s the largest permanent show in the world with a nightly cast of 1,500, all of whom are volunteers. None of them get paid. There are 3,400 of them trained to play their roles and it’s held 28 time per year in front of a crowd of 14,000. For the volunteers, it’s a huge social and cinematic event and they train all year. It’s so popular that there are over 1,000 on the waiting list to volunteer and you can’t buy tickets for the event for another year. I won’t say too much about it but it is simply massive, incredible and beautiful (and hard to photograph). I have again, never seen anything like this. It started at 10.45 pm and went on until well after 12.15, so it’s a good long show too. It’s worth it for the fireworks alone. Being with the TEA gave us an all access pass to the whole site and the team that created it. It was a huge privilege and worth the membership in its own right. For only three days away it was completely exhausting, but to be able to get to see this place was worth it and i’ll be back to do it again. It does however make me sad when I see references to knights, castles and even Robin Hood himself that my home City of Nottingham, can’t even get an attraction out of the ground to recognise our most famous son. The French have delivered a genius show that would draw in millions of visitors if it was created here. Nottingham still hasn’t delivered a single thing. So, Nottingham, please take note. 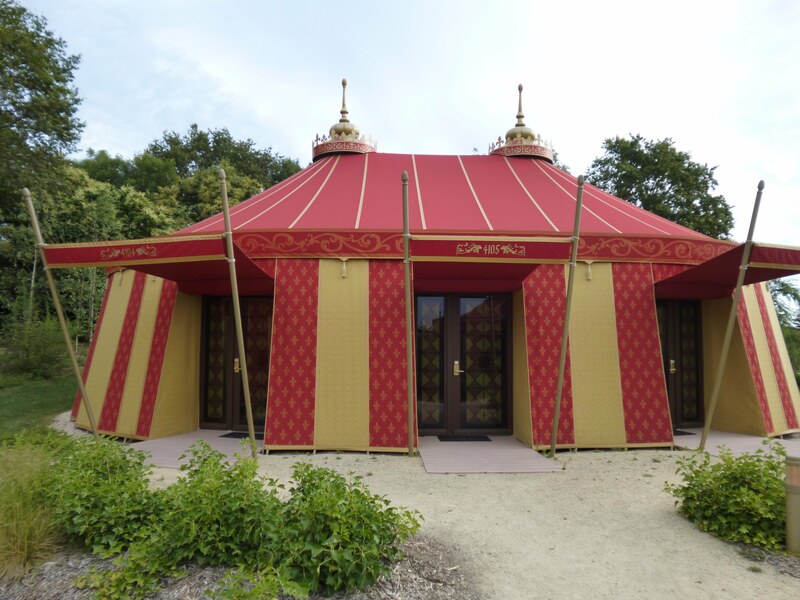 Puy du Fou turns over €74m and is very profitable, filling every hotel for miles around with it’s 1.9 million visitors per year. A little of this would go a long way. The accommodation offer is quite new, but growing fast. They may look like simple tents, but they house a fabulously well equipped four poster bedroom with wet room, two bunks for kids and even decent wifi. If you have kids you have to come here. If you don’t come anyway. It’s amazing, awe inspiring and unique. It’s the best kept secret and the best theme park in the world. And it’s my new favourite. I have written before about empty shops in cities and what I believe is the solution. Flexible rents for start-ups and some understanding in the payment of business rates. 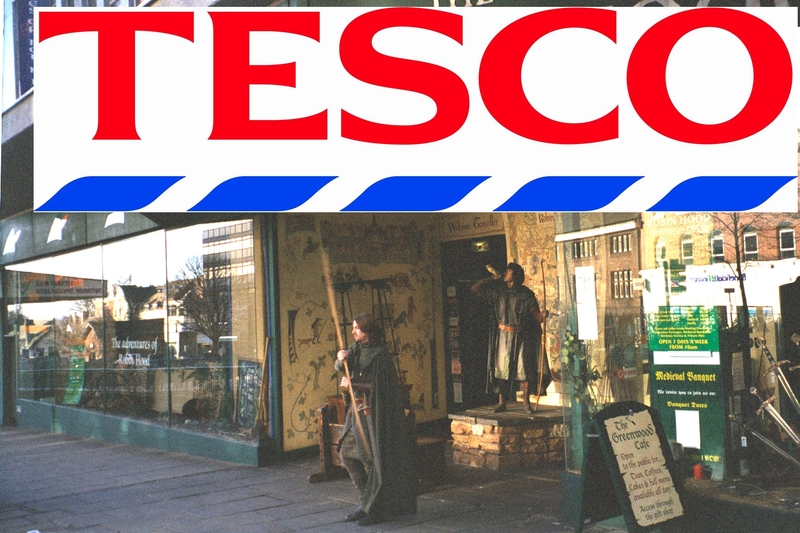 The latest move reported by the BBC that Tesco were to take over the former Tales Of Robin Hood site in Nottingham, proves it’s still not being addressed in any effective way. As one of those unfortunate enough to be on the receiving end of the presentation from the Bass Museum team who did have plans for the site, this is a real shame, but no real surprise. That proposal was so flawed as to be embarrassing. So why would Tesco move in and not look for longer to find a decent alternative tenant? Let’s say that the rent on the site would be £100k per annum and as we know, Tesco own the head lease. After six months empty, they will have to pay a full business rate, which adds another £41.5k to their bill. So, for them to leave it empty, costs them £141.5k per year. Therefore, as long as they lose LESS than that as a Tesco Express store, then it’s worth them opening it. In effect they are being incentivised by the system to open up all over the place. Surely it would be better for the long term good of the city to have some retail diversity? Or maybe a Robin Hood attraction, or even a permanent exhibition. Let’s set the Sheriff of Nottingham on ’em. Thanks to the somewhat out of date Nottingham Tourist Guide for the image. This a story hot off the press as I have just arrived back from the gala premiere of Robin Hood held at the Cornerhouse in Nottingham City Centre. 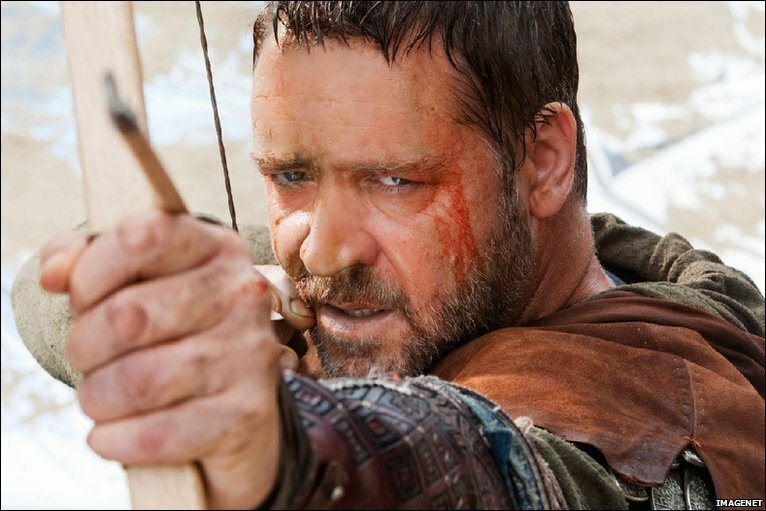 The film stars Russell Crowe as our hero Robin and Cate Blanchett as Lady Marion Loxley. She played a simply superb part and whilst this wouldn’t be the sort of film that would normally get Oscar nominations, I thought she played such a strong part that i’d be surprised if she doesn’t feature amongst the nominees. The film itself is a long and epic affair painting the history of Robin Hood before he was outlawed. As such, it’s a prequel before the sequel. As scene setters go, it is one of the most enjoyable films I have ever seen. I have read a few early reviews that have been mixed, but this has to have come from film hardened critics and not the general public like myself who will be enthralled by the story, amazed by the cinematography and drawn in by the plot. When we started working on the brand values for Robin Hood as part of the Sheriff’s Commission, we wanted him to be a strong, fearless character with huge integrity. So he fitted the character of our City. Crowe has done this in spades. What we couldn’t have expected (but what we really, really hoped for) was Cate Blanchett to play a strong brave and independent thinking woman. She certainly delivers this and more. There’s a bit of humour, some great historical placement, no real attempt at regional accents (apart from a bit of Welsh thrown in) and a good balance of action without it being ever gory or blood thirsty. The photography is just stunning. as they camera flies you through the valleys of the South Downs and the Woods of Nottinghamshire, you will be spellbound. I think you know what you can expect with Ridley Scott and this certainly doesn’t disappoint. I loved it. I’m going again at the weekend with my family and I hope you do to. To whet your appetite, here’s the trailer. What were the 17 learnings from the USA Trip? 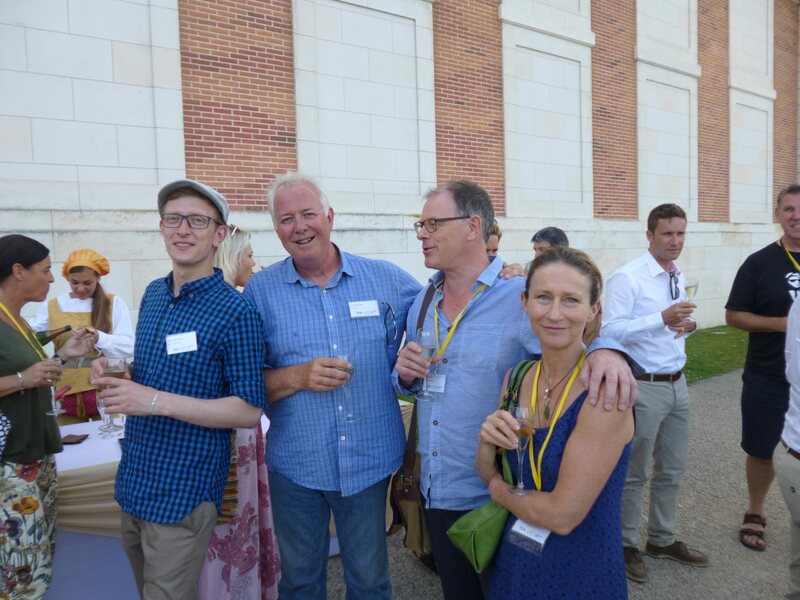 Tim Garratt, of Innes England and one of the team from the USA trip has written up the initial findings, using the learnings from architect Daniel Liebskind as the model on which to present. How do we summarise the whole trip, what we learned and how we can transfer it to Nottingham? This short presentation that was delivered to the full Sheriff’s Commission on Friday is the start point. Comments to enlarge the discussion are very welcome. So lets see whether we can get anywhere near a schedule today shall we? It’s an early start as we have lots to try and fit in, so we’re heading off at 8am, so this has to be brief. First off is a trip over to meet the team at the Golden Gate. A world class attraction will hopefully have a world class team behind the management of it, so there should be much to learn from them. This area of San Francisco is so amazingly touristy, it’s a bit like an American Blackpool, with Fishermans Wharf beings its rather nicer Golden Mile (or two). We’re going over to Alcatraz after that, but it is dependent on being able to get onto a boat, which seem oversubscribed. This may have to wait until Midday. At 4.30 I WILL do the Segway tour, complete with fetching Gilet and helmet. And I’ve heard a rumour that there is a baseball game at the At&T stadium up the road, which starts at 10.15 tonight. If its on ad I’m still awake, I’m going! The first full day of our trip and a busy schedule to start with. I’m still reeling with jetlag, but my phone going off at 5.30 local time here gave me an earlier start to the day than I was planning. So here’s how the rest of the day is shaping up, but its still subject to change, if more direction comes in from the people we are speaking to here and at home. 9.00am, we’re off to Paul Smith’s shop in LA for some promotional shots with the Sheriff. Paul Smith is one of Nottingham’s most famous sons and one of our most fierce and supportive advocates, so its great to be able to give him and his worldwide business something back for them to use in their own promotional materials. 10.00 It’s off to the Getty Center Museum, which is a beautiful building and a huge collection of different collections. Not quite sure what this will contain, but it will be interesting. We’ll be guests of their VP in charge of group visits, so we should be able to mine his knowledge. 12.00 Hollywood Walk of Fame. This is one to see as to how they have created a trail for tourists. Its one we have to learn from. How do we create our own Robin Hood trail throughout the city and county. Is it one to learn from or is it (as I suspect) a bit of a touristy nothingness? 2.00pm Universal Studios. This could be great. We’re meeting with some of their senior managers to find some behind the scenes info on how they do it, how they’ve funded it and how they manage their promotions and marketing. This could be one of the highlights of the trip, but I’ll add images and a full story later. Okay, we’re taking the Sheriff of Nottingham to the USA to see what they have to offer as the best visitor and tourist attractions in the world. We’ll be looking at some big ones, some small ones and some obviously in-between. We’re aiming to see the very best…. But in fast forward. The timetable is pretty grueling as you can see below, but we still have lots of flexibility and would welcome any advice as to what you think we really need to see. Is it world class, is it the best it possibly can be and is it something we can learn from by seeing? If it is, we want to see, so all suggestions welcome. I’ll list what is fixed on what days and I’d love you to help me shape the rest of our time. I’ll be blogging as I go along, so hopefully, decent Internet connections allowing, you’ll see what we’re seeing very soon after we’re seeing it.